Magnitone Pulsar is a face & body brush. Fully waterproof so excellent to use while in the bath or shower, I like this is a dual brush and will look forward to using the body brush in time. I'm only going to be reviewing the facial brush experience. Within the box there is 1 x Active Clean & 1 x Body Cleanse brush in the box. I received the Magnitone Pulsar on Wednesday 20th November. Excited to use this after already having a rotating headed cleansing brush. How would I get on with a pulsating brush? 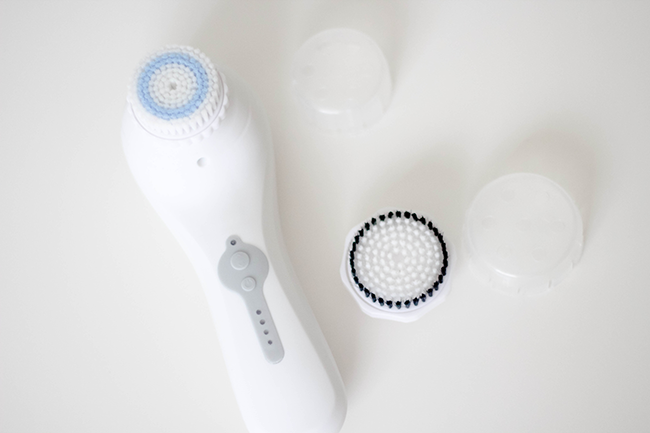 This has four different settings: PulseLift massage for skin stimulation, Exfoliate for dry skin removal, Sensitive for delicate and irritated skin, and Deep Clean for makeup removal and pre cleansing. While it said it required 24 hours to charge for first time use by Thursday it hadn't fully charged or by the Friday. Strange, I decided to start my trial on Friday. This is to be used morning & night for one minute. - apprehensive for a twice a day 'deep cleanse' I decided to give it a go. Here's my 7 day diary. Starting on the forehead and in-between the brows, moving to the cheeks, onto the nose and around the mouth & chin. In the morning when I used this of course it was different to the current cleansing brush as this one is mostly by pulsating vibrations. Beginning on the sensitive setting, once finished my skin felt quite dried out, which was a little frustrating that it now felt dry. I decided to use more of a rich moisturiser after that for the day, reap more moisture into the skin. By the time the evening rolled around and I did my usual night routine, I exfoliated before using my of course LUSH Ocean Salt and then started to cleanse using the brush, this time around my skin felt EXTRA smooth and hydrated afterwards and brighter. I have to stop myself touching my face up!! Unfortunately my skin felt a little dry in this morning, maybe too much with my routine last night. I decided against using it and used more of a hydrating cleanser to keep the dry skin away. Today was the first time wearing make-up since introducing this, after taking off my make-up I was intrigued to see how much might of been left behind. Not too much residue but the skin started to feel sore and irritated. I discontinued use today only because the skin felt dry, sore and irritated. I decided on doing a facial and a face mask aimed at putting the moisture back into my face. The skin is feeling less dry this morning and as I want to wear make-up tomorrow I'm not going to dry out the skin, I'm leaving this for night time use. Used this tonight and my skin didn't feel how it did yesterday, felt a lot more hydrated and smooth! Thankfully my skin's over the top dryness has disappeared and I've not had any break-outs, one that I thought might happen if you believe in skin purging take it as you'd like. I again was wearing make-up today so once cleansing my skin and removing most of the make-up I began to use this to remove any left over dirt. I was happy that my skin wasn't as dirty as I thought and it removed any last traces of make-up. If there was any time I'd probably get a breakout, I thought it would be today. As I cleansed and cleaned the bristles were clean, my face didn't feel dried out this morning. Throughout the day I was fresh faced just a serum & moisturiser and even though it's in the colder months, I normally have oil and my face just seems "normal". After being out most the day without make-up there's sure to be some just daily grime. Using my cleanser, gentle started to cleanse the skin...there was a small amount of dirt discolouration but nothing off putting. One spot. Just one small spot on the cheek. The face felt a little dry this morning on the forehead and top of my cheeks. Debated if I should use the Magnitone this morning but thought I'd cut the time in half. 30 seconds instead of 1 minute. Using it tonight as it needed a bit of exfoliation, face felt good afterwards, not raw. Overall thoughts Observing my face this morning, it is definitely normal in skin type. My oily parts of my skin seemed to be kept at bay, the skin feels clean, no irritation. That small spot from yesterday has gone down & dried out slightly. I don't think I could use it daily, my skin seemed to go up & down in pattern over the week and it might just be settling or got use to the new routine. I always say it's important to pay attention & listening to the skins needs, that's what I'm going to do, I would DEFINITELY use this after make-up removal and when the skin needs a deep clean and an exfoliation. The bristles could be the issue, I probably need to get the sensitive brush heads and see how I get on with those in comparison. This is a welcomed addition to my skincare routine, grateful for it, it's nice to have the various settings as I can target my skins particular needs that morning / evening and the fact it's a body brush too, is a bonus. (from 20th November to 3rd January, 2014). This product was sent to me in consideration for a review after a 7 day trial. I was not paid for this post. I have been so unsure about whether to get a device like this so I got a manual face brush to start me off…so far so good, a couple of break outs that I'm trying to control with Super Spot Remover from Origins. I would never ever use a face brush every day, let alone twice a day! I think two or three times a week is more than enough even on oily or sensitive skin - otherwise it's like having a deep facial every day which is way too much for the skin. It worries me that you experienced dryness and irritation with this, that's not something I would want but then if it settles down once your skin gets used to the device then maybe it's worth it?